SAN DIEGO – The 53 elite prospects taking part in this weekend’s 15th annual Perfect Game All-American Classic will put their competitive natures on display for the entire country to see during Sunday night’s nationally televised all-star game at the Padres Petco Park. On Friday morning, in a much more intimate and personal setting, that same sense of competitiveness resulted in history being made in PG’s ever-expanding theatre of philanthropy. The final ledger sheets will show the East topping the West in this race for fund-raising bragging rights, but at the end of the day the members of both teams will sleep comfortably knowing that the true – and certainly most deserving winners – were the young patients at Rady Children’s Hospital-San Diego’s Peckham Center for Cancer and Blood Disorders. These determined top prospects from the class of 2018 combined to raise $59,080 through Friday morning (donations will continue to come in through Sunday) with the East Team raising $30,140 and the West $28,940; all proceeds from the event will also be donated to Rady. Those totals are impressive, to be sure, but the “big picture” numbers are even more so. Since its inception in 2003, the PGAAC has now raised more than $1 million for use in the fight against pediatric cancer and since 2005, more than $750,000 has been directed to Rady’s Peckham Center for Cancer and Blood Disorders. All of those totals were announced during the PG All-Americans’ visit to Rady Friday morning in the minutes before they were given the opportunity to interact with many of the kids who will benefit the most from those dollars. The significance was lost on no one. Clement used the word “incredible” when asked about his feelings on the way in which the prospects embrace the Rady connection to the All-American Classic. He said when the players are surveyed after the event has concluded, they overwhelming identify the hospital visit as the aspect of the PGAAC experience they found most impactful. “All of the other great things that they get and they do are remarkable, but they don’t compare to this cause,” Clement said. East Team All-American Triston Casas from Pembroke Pines, Fla., put the East over the top by raising a total of $6,700. Vinny Tosti, an All-American from Santa Rosa, Calif., led the West’s fund-raising efforts with $3,875. Any way it’s sliced, this was a total team effort on both sides. “I’m blessed and I’m fortunate to be able to be healthy and to be able to prosper, and (many) of these kids aren’t as fortunate as I am,” Casas said. “Any way that I can help, whether it’s raising money or if it’s coming and spending some time with these kids, I just want to help. 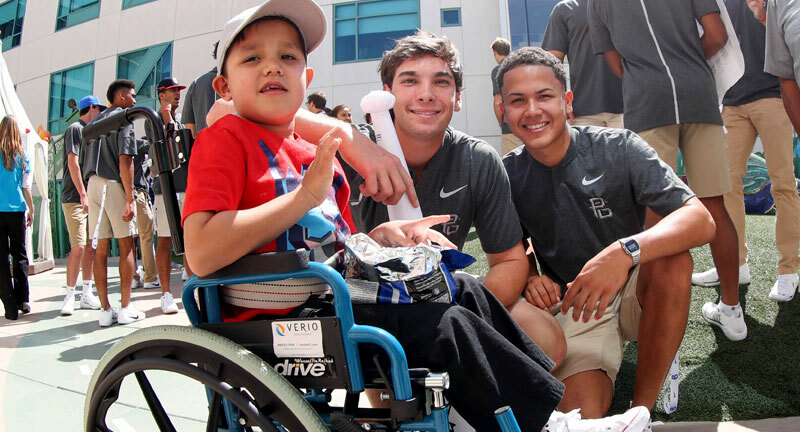 Carol Damon-Scherer, the Vice President of Development for Rady Children’s Hospital Foundation, knows that many of these young prospects may very well have started their professional baseball careers by this time next year. That change in fortune will bring about a change in lifestyle, and Damon-Scherer is pleased to see that that the teenagers are already willing to accept the added responsibilities that will come with their new, much more prominent position in life. These special young men – those that choose to forgo a professional career right out of high school will end up in college – seem to understand that they will become role models for many younger children (along with some that are only a couple of years younger than they are) and are likely to become very active in their communities. “It’s important for them to learn at an early age the responsibility of philanthropy and giving back to their community. Most Major League Baseball teams are very active in their communities and I’m sure they will be asked to participate in a lot of activities,” Damon-Scherer said. Perfect Game first guided its philanthropic efforts toward pediatric cancer care and research during the first All-American Classic played at Hammond Stadium in Fort Myers, Fla., in 2003. Those efforts continued during 2004 and ’05 when the event was held at Ripken Stadium in Aberdeen, Md., and really amped up when it settled into Tony Gwynn Stadium at San Diego State University in 2006-07. It was in 2006 that Rady Children’s Hospitable became the beneficiary and it remained in that position when the game moved to Dodger Stadium in Los Angeles for a one-year stay in 2008. The Classic has been staged at Petco Park every year since 2009, and that’s when the players’ annual visit to Rady became the most highly anticipated segment of the event’s four-day schedule. In addition to the money Triston Casas, his dad Jose Casas and other family and friends raised for Rady, Triston and Jose also decided to donate to Perfect Game a special piece of equipment. It is the first baseman’s glove that Triston wore when he was playing in the championship game at the 2016 COPABE Pan American Championship in Monterey, Mexico, for USA Baseball’s 18u National Team. Casas, at 16 the youngest member of that year’s USA Baseball’s 18u squad, hit a pair of home runs in Team USA’s 6-1 championship game victory over Cuba. He is donating the glove – which will be signed and displayed in a case – to PG in the hope that it can one day be used to raise even more money for Rady Children’s Hospital.